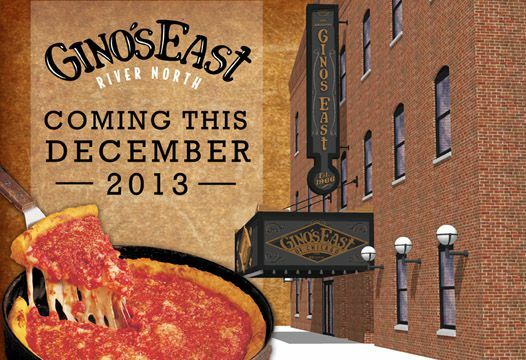 Gino’s East Wells Street location is moving! This December we’ll be moving our location at 633 N. Wells just a few blocks away to 500 N. LaSalle. Our new River North location boasts 3 floors and tons of new features. We’ll still be cooking up our legendary Chicago style deep dish pizzas, but we’ve also added a bunch of new items to the menu, including gourmet appetizers, panini, and delicious fresh salads. We’ve completely remodeled the interior of the space while staying true to its history as a legendary Chicago landmark. On the inside, we’ve given each floor its own character: Our first floor will feature a dining room and, for the first time ever, Gino’s very own brewery! Our first batches of beer should be finished early next year, so be sure to stop by for an original Gino’s East beer and deep dish pizza after work! On our third floor we’ve built a huge, bright space perfect for parties. With a full bar, stage, DJ booth, and great views of Chicago’s skyline, we know Gino’s East River North will become a go-to downtown destination for parties and events. Have any questions? Feel free to reach out to us on our website, or follow us on Facebook, Twitter, and Instagram to interact directly with Gino’s East! We’ll be posting across all our social media platforms to keep our fans updated with the move, new menu items, progress on the brewery, and more!